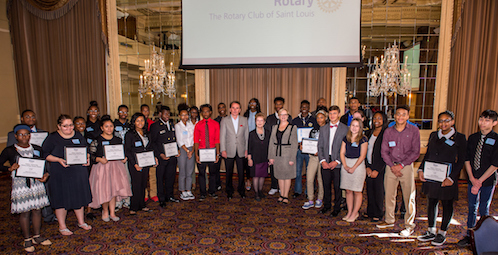 ST. LOUIS – Webster University and the Rotary Club of St. Louis recently awarded college scholarships to 28 high school seniors from 14 St. Louis public high schools. The scholarships could be worth up to $20,000 per student over four years during their undergraduate experience at Webster University. The Webster-Rotary scholarships were awarded during the Rotary’s annual Young Citizens Award Program, held at the Missouri Athletic Club in downtown St. Louis. The students were nominated by the principals of their schools. In order to be considered, they had to have a minimum 2.5 grade point average, excellent attendance, good citizenship, and community involvement in their school or community. Kelvin Adams, the Superintendent of Schools for the Saint Louis Public School District, delivered the keynote speech for the event. He oversees more than 25,000 students in grades Pre K–12 and is responsible for the day-to-day operations of the District’s nearly 4,000 employees and $285 Million budget. President Elizabeth (Beth) J. Stroble and Provost Julian Schuster attended the event to announce that the scholarships will be made available to the students if they chose to enroll in Webster University. Each student will receive $5,000 per year, with a chance to renew if the students take 13 credits per semester or more, maintain a cumulative grade point average of 3.0 or better, and continuously enroll from semester to semester, with summers off. Students who chose to attend community college first will become eligible for the scholarship upon transfer to Webster University. Webster University has also partnered with Rotary Club of St. Louis for more than 40 years for the 8th Grade Awards. 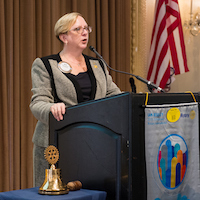 Beth Russell, assistant provost for Graduate Studies, is the current President of the Rotary Club of St. Louis. Russell has been a member of this club since March 2002. Known as Club 11, the Rotary Club of St. Louis was chartered on February 22, 1910, and consists of community leaders who come together weekly to exchange ideas, engage and assist in the local community, as well as work with Rotarians around the world focused on putting service above self.